This week the recording of my Seasons Lost double violin concerto is released on Cedille, with violinists Jennifer Koh, Jaime Laredo, and the Curtis 20/21 ensemble led by Vinay Parameswaran. I am in august company on the CD, with works by Philip Glass, Anna Clyne, and a lesser-known composer named John Sebastian Brook…or something. I wrote about Seasons Lost earlier on this blog, and I’ve been so excited to see it programmed. The double violin concerto is a classic Baroque instrumental medium, and I used it again in Virtuosity (the string orchestra piece I wrote for ECCO last summer). This setup allows for so many layers of musical conversation: solos, duos, tuttis, and soloists and duettists (?) with the larger group. And though word “concerto” suggests playing together, it emerged as a form with soloist(s) cast in opposition to a larger group (which was often–hundreds of years ago–the community band). And so, that’s clearly evolved. The folks performing on this recording are at the very top of the shelf, and I don’t think I can fit all of the superlatives they deserve in just a sentence or two. You just have to hear this playing; the sound this ensemble produces and the music that Jennifer and Jaime make together is next level stuff. There are no dull moments in this performance: every phrase has a color, a vibrancy, a concept behind it. We made the recording a year ago in March with Judith Sherman. 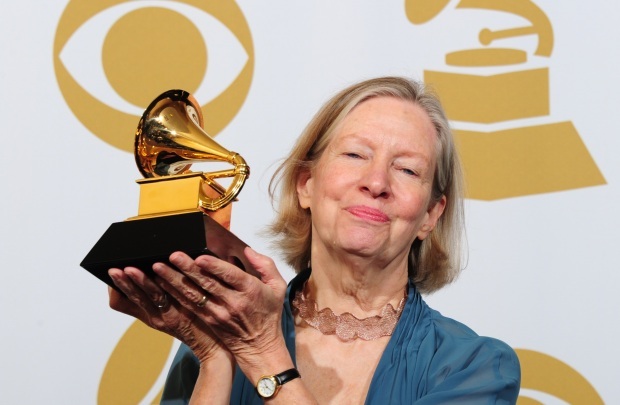 Judy is truly a legend, winning so many Grammys and accolades, and in our sessions I saw why. She is the ultimate producer; calm and composed, but totally meticulous after she establishes the big picture. I’ve often wondered why writers have editors but composers don’t. Isn’t that weird? It’s the most natural thing in the world for a writer to send her manuscript into her editor and get back major revisions, but composers—this is pretty much unheard of. Perhaps there are people out there who could do this kind of thing well? To listen to a composer’s work and say “this is too long, this we want to hear again, this is out of tune because the piccolos are playing…” As horrifying as the idea might sound to some colleagues, I see a niche profession for some enterprising instrumentalist. Otherwise, the producer is as close to the composer’s editor as you get. Judy would listen to a take in our sessions and offer recommendations about how to take it again, including making alterations in my score in timing and dynamics. She was always “right–” there’s so much value of an expert–and objective–set of ears set on the music. Recording sessions at a venue are not like you see on TV with the room-sized mixing board, the poshly dressed record producer (no one was wearing sunglasses), and the “talent” playing on the other side of the big glass wall. The gear is set up in a neighboring room cables lain like tiny tributaries from the recording space to the booth. There’s a PA put in place to communicate with the musicians from the booth (the so-called “Voice of G-d”) and a set of mics ranging in number from a couple to a gaggle depending. The recording style of the producer is reflected in the placement of those mics and the balancing of the recorded sound through the design of the sound engineer. Naturally, everyone and every setup is different. Then the recording begins. Often you run through the whole piece first to get a sense of it and to get the bows and bodies moving. Section after section is worked through, and often over and over again, until it is nearest to the perfect representation of the music. The producer can make tweaks and changes later, but the idea is that the ingredients need to be the best they can before baking the CD (or burning it, as the case may be…) As we listen to each take, we make small notations in the score of what sounded good and what needed to be redone. Soon, our music is covered by red and green marks saved for future reference long after it’s “in the can” and ready to be mastered. So please go check out this new recording–it’s unlike most anything out there­–with this repertoire and these players–and I am beside-myself-excited for the release!